Everybody loves balloons. Little kids mob the guy who has balloons every time they seem him. 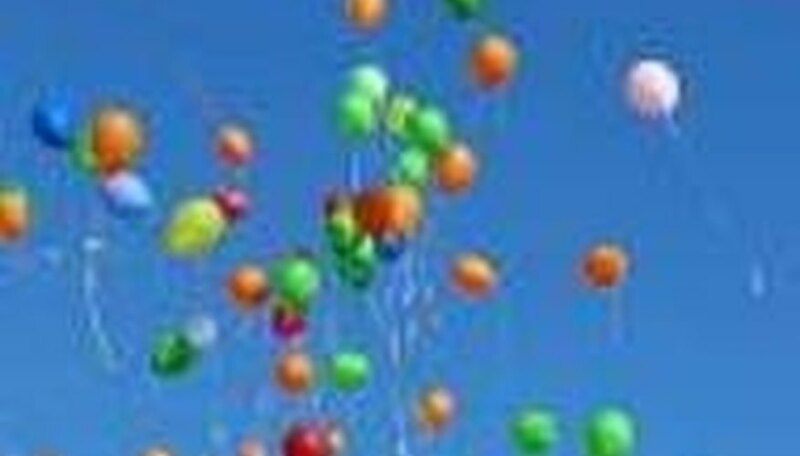 What fascinates us even more is either popping the balloons or untying the bottom and let them fly all over the place. But what may be even more interesting is finding out whether balloons can fly off straight. Take a balloon and look at the spout of the balloon. The hard part about balloons when they take off is that they are a constantly changing mass that has unchecked propulsion and movement. Their shape is constantly changing, likewise making the spout constantly change position, giving them that erratic flight path. Cut a strip of construction paper that is ½ inch wide and 3 inches long. Roll it up into a tube. Make it as tight as possible. Insert it into the spout of the balloon and let it unroll. When it completely fills the hole, grasp the center of the spiral and pull it down into a cone. Tape the cone completely. Use as much tape as it will need to make the cone one solid piece of tape and paper. Leave a hole in the bottom of the tube. Roll the lip of the balloon's spout off the top of the now solid cone and blow the balloon up. When it is full, pinch the balloon higher up, leaving most of the spout exposed. Roll the lip of the spout onto the cone. Let go of the full balloon with spout inserted. The balloon will still change shape but will only deviate slightly from its upward trajectory. When you put the coil of paper into the balloon, make sure there is a bit of the coil sticking out. Balloons can be blown up larger than most people realize. For an illustration, connect a balloon to an air compressor or pump and blow it up till it pops. If you put a little vegetable oil in the inside of the balloon, the cone will slip in better When taping the cone, tape in circles for the strongest cone. Do not manually blow up balloon till it pops; this can cause facial and eye damage. Let the balloon go outdoors to avoid injury to anybody. Large pack of normal tear-shaped balloons. Contributor. "How to Make a Balloon Fly in a Straight Line." Sciencing, https://sciencing.com/balloon-fly-straight-line-4843428.html. 24 April 2017. What Experiments Can Be Done to Amplify Sound?